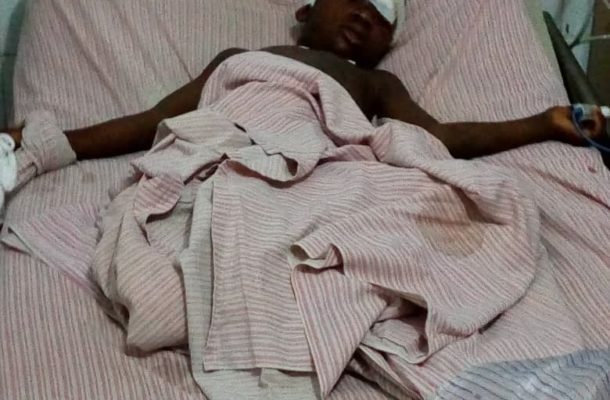 Awuni Simon, a six year old boy has been run over by a tipper on Friday February 8 2019. Young Simon who is a K.G 2 pupil of the Nkawkaw Presby basic school was returning home from school when the incident occurred at the Holy Family Hospital. Speaking to the Auntie, Madam Cynthia Awuni, she confirmed that the boy lost both his legs when the tipper truck with the registration number GB 633-12 had hit him from a distance. According to a eyewitness, the truck run over his legs cutting the two instantly. The right leg was amputated at the Holy Family Hospital. Madam Cynthia while speaking to ghanaguardian.com confirmed that the police is yet to comment on the incident and that the driver is on bail. She further added that the driver had visited the family at the hospital to see the condition of the boy. She stated while wailing over the condition of her nephew that the boy had told her while on admission that he was on his way home from school when the incident occurred. She said, " He spoke to me when I first set eyes on him at the hospital but later when i spoke to him, he only kept responding with his head and not by word of mouth". The boy's father, who also happens to be Madam Cynthia's brother has been left in the state of shock and is yet to comment on the issue.